Fifth seed Stan Wawrinka was knocked out by Daniil Medvedev in the biggest shock on day one of Wimbledon 2017. 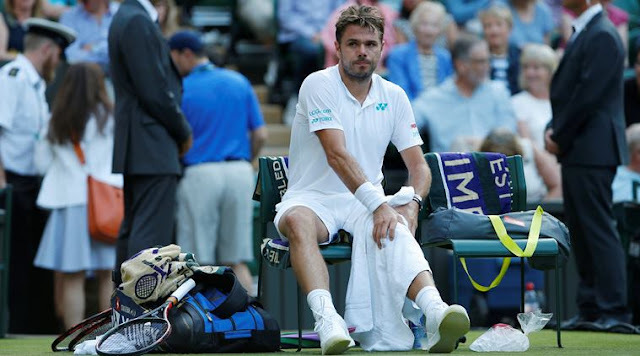 The 32-year-old, a three-time Grand Slam champion, needed ice on a knee injury between points as he fell to a 6-4 3-6 6-4 6-1 loss on Centre Court. Earlier, Rafael Nadal began his bid for a third Wimbledon title with a comfortable win over John Millman. But world number 20 Nick Kyrgios failed to reach round two, retiring from his opening match because of a hip injury. Medvedev's victory over world number three Wawrinka came just hours after the 21-year-old moved into the world's top 50 for the first time. It was his first Grand Slam victory on his Wimbledon debut, and he celebrated by dropping to the court in front of the net and kissing the ground. "At 5-1, I started thinking about what to do after the match and I kissed the grass because it was my first Grand Slam win, even though people do it when they win Wimbledon," he said. Medvedev lost in the first round at the Australian Open and Roland Garros earlier this year, but arrived at the All England Club feeling confident after an excellent start to his grass-court season. The Russian reached the semi-finals at Eastbourne, losing to Novak Djokovic, and also made the last eight at Queen's and s'Hertogenbosch. "I have had a great grass-court season and knew Stan had some problems. I knew I had a chance if I played good, and I played amazing." Wawrinka, having already won the Australian, French and US Opens, was attempting to become only the sixth man to complete the career Grand Slam in the Open Era. But the Swiss only played once on grass before Wimbledon, losing at Queen's to eventual champion Feliciano Lopez. "I wasn't feeling the way I wanted to feel but I played against a great player," said Wawrinka, who has never gone past the quarter-finals in SW19. "I had problems with the knee since Queen's. It is not something new but something I had in the past. Apparently grass is not the best surface for my knee and I need to figure out what I'm going to do and come back when I have no pain. "I thought two weeks between Queen's and now would be enough but it wasn't. I'll talk to my team and doctor and take the time I need."